It’s trly amazing what projects our customers realize with our paper twines. I need to admit that I’ve known Linda Barabé for quite a while (13 years to be exact) and I’ve always admired her creative energy and ideas. Linda says that she has had problems first to come up with a suitable project for the paper twines because they seemed very precious. 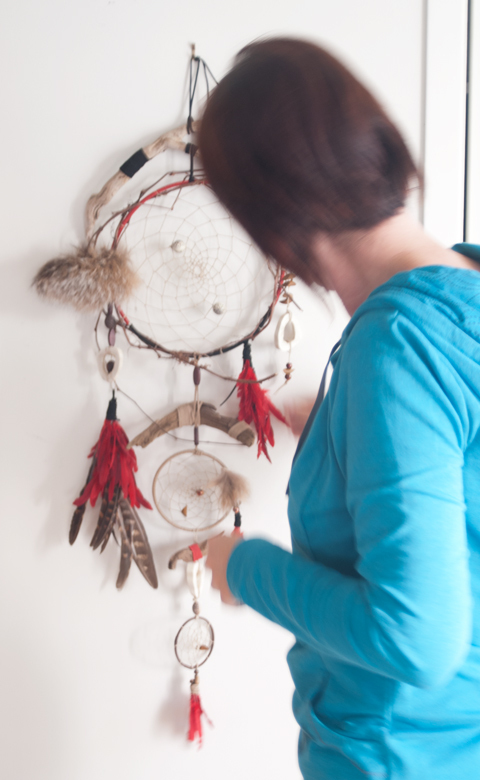 But eventually it came to her: paper twine dream catchers! 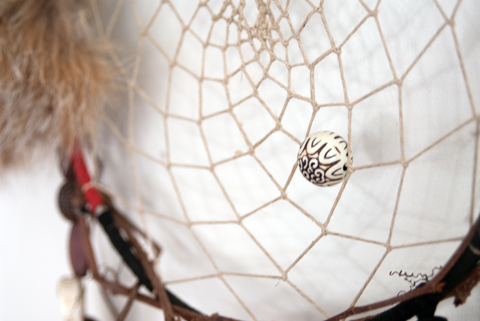 By now Linda Barabé has made a lot of dream catchers because as soon as they’re finished and hang in the house a visitor falls in love with the newly finished piece – and it leaves to catch bad dreams at a different place. Luckily living in the Canadian province of Québec there is an abundance of natural materials and the whole family helps to find old branches, feathers, bones and more. For the big dream catcher shown here a huge, cleaned veal bone was sawn into fine slices by the family butcher. There are different beliefs of how dream catchers actually work – you can read more about it here on wikipedia. 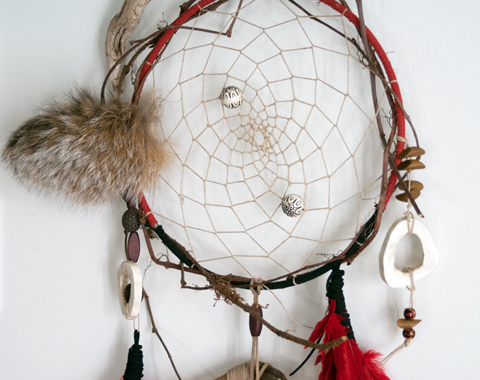 The Ojibwa believe that a dreamcatcher changes a person’s dreams, some say that all bad dreams get caught in the net and only good dreams can filter through. 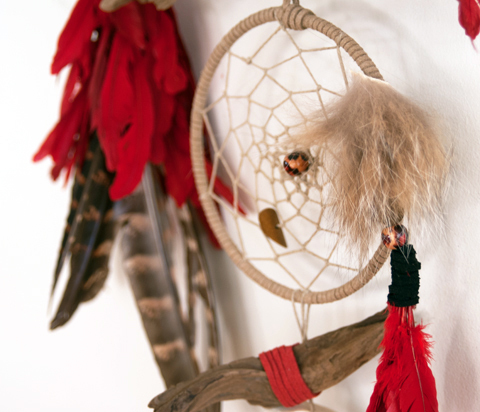 The three-piece dream catcher shown here was made especially for Linda’s son so the red colored feathers were carefully chosen to his likings and the wooden pieces all come from places that are meaningful to him. The loop itself is wrapped in leather cord and the net is woven/wound out of natural paper twine. Linda Barabé initally followed dream catcher courses in Canada and by now she herself is teaching this tradition as well. Introducing paper twine as a new, natural material is quite a great idea – thanks, Mme. Barabé!